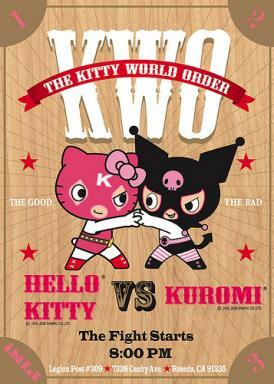 Pro Wrestling Guerrilla, in conjunction with Gente California and SANRIO Co., LTD., will present the first ever professional wrestling match for the Kitty World Order (KWO). On April 5, 2008, the cheerful Hello Kitty® and mischievous Kuromi® will meet inside the wrestling ring in a classic battle of The Good vs. The Bad. This match between these two beloved characters has been sanctioned by SANRIO Co., LTD. and PWG, and will be part of a live event that will feature PWG World Championship and PWG World Tag Team Championship title matches. The event takes place on Saturday, April 5, 2008 at 8:00PM at American Legion Post #308, located at 7338 Canby Ave., Reseda, CA 91335. General Admission tickets for the event are $20. They for got ‘The Ugly’ oh wait…..that migh be Darlene’s spot…. Um, okay…. that’s a little weird. Are they people dressed in Big HK & Kuromi costumes? Fakester Feline alert! We all know Kitty has no mouth. Kuromi will kick her a$$. I think they would get more people if all they wore was the HK and Kuromi mask and nothing else and were all oiled up. The only sure sign that the apocalypse is happening is that this blog exists and people take you seriously. The only people that should be speechless are us that have to read this drivel. Hello Kitty is loved by people who participate in all sports so why should this be surprising? And everyone knows that good always wins over evil. Hello Kitty in wrestling will bring thousands of new fans to wrestling. It’s a great thing and you should write that truth instead of this drivel. Darlene….kill yourself really…you need to do something with your life don’t you?…or..you need to confess that you are a fan of this blogger xD really i think so XD!!! I love how HKH doesn’t really write anything slanderous or anti-kitty in this post, yet Darlene still feels obligated to jump on him. to Jesse: Maybe Darlene wants to hump something. She’d make secks with Dear Daniel if she could! Prime example being you? Maybe? The words “Kitty World Order” are scary enough to me, no matter what it comes associated with. Makes me feel like the fear of being dominated by the kitty are real enough. The thing that I find disturbing is that the figures on the poster don’t look so much like Hello Kitty and Kuromi, but look more like Powerpuff Girls wearing Hello Kitty and Kuromi costumes! @brien: you noticed the PPG similarity too??? And phrase ‘Kitty World Order’ scares the crap outta me! See, she really is trying to take over the world…maybe Warner Bros. should come out with a new cartoon called Kitty and the Brain…. a beat down between the 2 cats??? in wrestling outfit??? and i want to see some blood and black eyes. I think I read this blog too often. This is beyond bizzarre. I personally would like to know how you talk the wife out of taking you to this one. Im praying this event will, miraculously, bomb. Agree totally with MHKitty and Brian, they don’t even look like the original characters! Oh wow, it’s Darlene again, commenting on another blog she claims is pointless to read yet is one of the first to comment, no doubt! Darlene, your obsession with this blog and possibly the writer is just as bad as his obsession with Hello Kitty merchandise- oh the mirth!